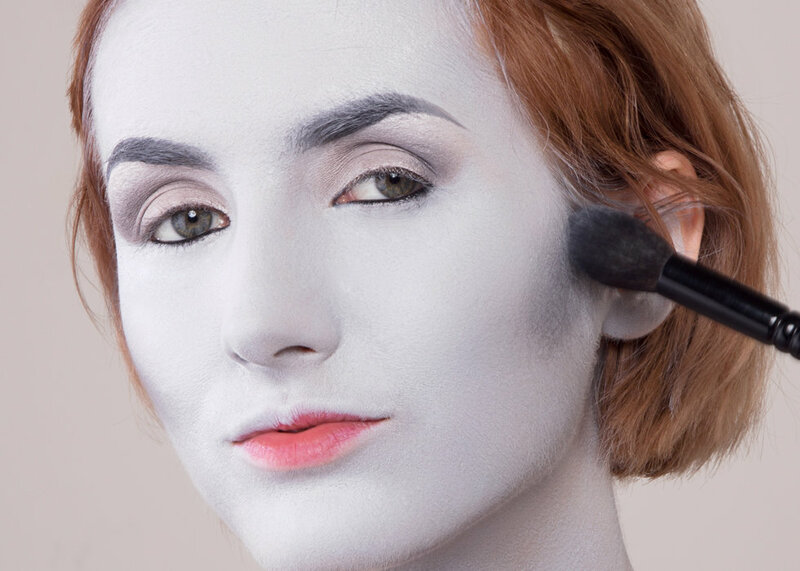 Grayscale Makeup You Can Master! Feeling gloomy this season? Why not try a grayscale makeup look that will impress your pals, plus work along with items you already have in your closet. It may seem tricky but it’s simple to master once you know the rules. If the task seems daunting, try snapping a black and white photo of yourself to get an idea of the shades you’ll need in your palette. Notice how only very dark colors appear black when viewed in a grayscale image– if you’re wearing red lipstick, the shade will translate to a gray tone rather than a black shade. Similarly, skin tones will appear in a variety of silvery shades depending on the depth– this means if you have a dark skin tone, make sure to pick an appropriately deep shade of gray base makeup, and vice versa. Don’t think of this look as black and white makeup– think of it as tonal replacement! First, prep the eye area with a primer so the heavy makeup doesn’t crack or settle too quickly into fine lines. 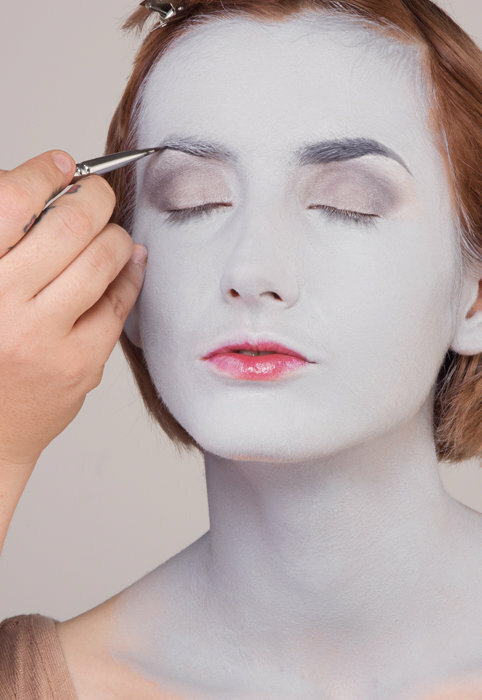 Apply grey cream makeup with a sponge all over the face as the base shade, leaving the eyelids bare. If the ears will be visible, take care to paint them as well, and don’t forget your neck! Choosing a creamy base paint that doesn’t dry will provide more even coverage and won’t crack or flake throughout the day or night. Set the makeup with plenty of translucent powder. 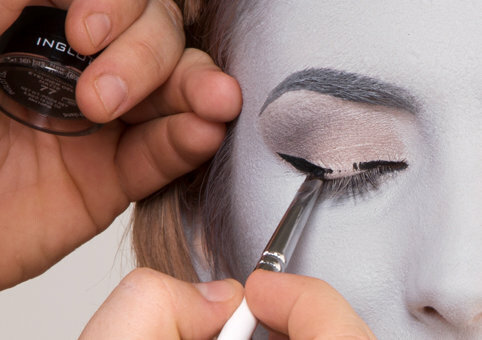 To prep the eyes, cover the lids in white Inglot AMC Eyeliner Gel in white #76, blending the edges into the grey. The gel liner prevents creasing while matching the finish of the gray cream base. Using Inglot Freedom System Rainbow Eyeshadow in 120R, shade the lids emphasizing the crease to add contour and depth—smoky eyes tend to look too flat with the grayscale effect. Add highlight to the brow bone using Sugarpill Diamond Eyes. Draw the brows in using Inglot AMC Eyeliner Gel in grey #78 and an angled brush. To bring out the eyes, tightline with Obsessive Compulsive Cosmetics Cosmetic Colour Pencil in Tarred to get rid of any pink tones. Bring out the contours of the face using the dark gray of Inglot Freedom System Rainbow Eyeshadow in 120R. Shade the cheekbones and the sides of the forehead up to the hairline. To finish the eyes, create a vampish wing using Inglot AMC Eyeliner Gel in black #77 to make them pop. 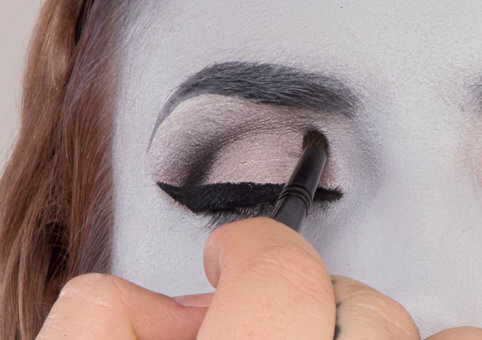 Blend the wing into the contour with Sugarpill's black pressed shadow, Bulletproof. Then contour the nose using Inglot Freedom System Rainbow Eyeshadow in 120R, starting from the inner brows and swiping down either side of the nose. Curl the top lashes. Start at the base, squeezing gently, then pulse the curler out to the tip of the lashes. After curling the top lashes, apply several coats of black mascara to the top and bottom. Finish the effect with a pair of false lashes for drama (try a silvery sparkling pair like Sugarpill's Baby Dewdrop lashes for an enhancing effect). For the lip color, blend together Obsessive Compulsive Cosmetics Lip Tar in Tarred (black) and Feathered (white) for a custom gray color. Before applying, line the lips using Inglot Eyebrow Pencil in #502, then fill them in with your hand-mixed shade.